Today, you celebrate your first birthday. Right now, you are toddling around the floor in front of me, playing with your toys. Your brown hair is escaping from its entrapment in pigtails, little wisps of curl tickling your neck. You are on a constant pursuit of the ribbons, clips or bows that might be lurking in your hair. Your eyes are a blue-tinted hazel and are heavily lidded like your daddy’s – also like his, they are full of laughter and often a little mischief. Your skin is so creamy smooth, although your little legs and feet are beginning to brown from our many trips to the pool. Your rosebud lips are pink and perfect. You have eight little teeth, all showing now as you grin cheekily at me. You are my wildest dreams come true. My most heart-felt wish granted. My greatest hopes personified. Lucy, there was a time, after your older brother died, when I thought that I might never again truly know happiness. A time when I tried to smile, but my eyes always betrayed my deep sadness. When I felt like a hollow shell of the person – and of the mother – who I once was. And then I learned that I was pregnant with you. Even from the beginning, you filled the emptiness inside of me. At first, your fluttering presence within me was like a tiny pin-prick of hope in my broken heart. I was scared then for so many reasons – that I might lose you too, that I wasn’t whole enough to be a good mother, that the grief I carried with me would never abate, that I would unfairly compare you with your brother before you. But, with every passing week, my fears began to fade. You depended on me for your life, as much as I depended on you for mine. Your strong kicks and constant hiccups that shook my belly assured me that you were strong and healthy. That, this time, everything would be different and that you would be ours to keep. And so, at 8:08 AM on Thursday, July 15, 2010, all 10 pounds and five ounces of you came screaming into this world. The doctor held you up, your mouth wide open in protest and your skin red with life. You cried out, and my soul recognized your voice. You looked at me, and my eyes answered yours with tears of joy. When you snuggled against me for the first time, I felt your heart beat next to mine, and I began to heal. Daddy and I named you “Lucy” because it means light, and that is what you are. You brought us out of the darkness and back to life. You were sent to us by the angels above. You were hand-picked from the stars. You are the embodiment of all that is good. While you do resemble your older brother, you are your own unique and amazing person. As much as he was patient and calm, you are spirited and in perpetual motion. Still, you do share one very important trait with him – you seem to radiate with happiness from within, and you surround those near you with that golden glow. And, of all of the people in your life, you seem to most readily recognize your brother – you wave at his pictures and say, “Hi, Bubba.” While you will not grow up together here on earth, we love that you already know that he watches over you from heaven. With every passing month, Daddy and I have been astounded with how quickly you have grown and how much you have achieved. You don’t just reach milestones, you demolish them. You are walking, talking and eating with flourish. Your laugh is infectious. You have never met a person you didn’t like. You embrace each new life experience to which you are introduced and entice us to do the same. You are a girl who clearly knows what she wants – and what she doesn’t want – and isn’t afraid to let us know in either case. You definitely love to watch “Yo Gabba Gabba” and to eat cheese – perhaps a little too much of both – but hate to sit still for too long. Splashing in the water and playing with your tea set are two of your favorite activities. You are frightened of the sounds of the blender, the vacuum, and thunder. You won’t go to sleep without Bun Bun in your arms and your thumb in your mouth. You love to growl like a scary bear, and, when you hear someone say “awesome,” you throw your arms over your head. You clap every time we exclaim “yay!” You think it is hysterically funny when someone sneezes, when Daddy “chases” you, when the dogs run through the house, and when I twirl with you in my arms. You always fall asleep in the car, even if we’re just driving for a few minutes. We cherish every little detail of who you are. Sometimes I wonder where my baby went, because you already seem so much older than your one year. Still, I will remember these precious first moments of your life forever. And, in those rare, quiet times when you lie drowsily in my arms, I know that you’ll be my baby girl always. Lucy, you amaze me every day with your strength and your fearlessness. You are smart, beautiful, sassy, and already so very independent. You also are stubborn, quick-tempered, and easily frustrated, not unlike me. I try not to laugh when I tell you to do something, and you furiously shake your little head “NO.” In fact, I sometimes think of you as my little mirror – by watching you, I have learned so much about myself. You have made me a better person. While I’m still a bit broken – and I fear I always will be – I will work my hardest to be the kind of mother that you deserve. Even if you don’t always agree with what I say. I am blessed to wake to your smile in the morning and end each day with a goodnight kiss. I hear you call “Mama,” and I’ve never heard a more beautiful sound. You reach up for me to hold or comfort you, trusting that I will always be there. And, Lucy, I promise you that I always will. When you call for me, I will come. For the rest of my life and beyond. No matter what the future holds for us, you are and always will be my perfect daughter. One day, when you are older, you’ll find this letter in your baby book, and I hope, as you read it, you will understand how much Daddy and I love you. How you changed our lives for the better. How everything you do amazes us. How you are a miracle to us. How proud and lucky we are to be your parents. Happy first birthday, Lucy Catherine!! 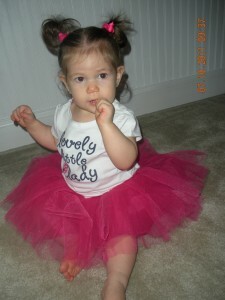 4 Responses to Happy First Birthday, Lucy Catherine! This is such a beautifully worded tribute to our little angel and all she has done to begin to heal all of us. Lucy is our light for sure! *sigh* great … now i’m crying AGAIN! This is just beautiful! She will indeed cherish this when she is older. Happy Birthday sweet, beautiful, sassy baby Lucy! I hope you have a fun filled weekend (I know you will have a great party). Always know how much you, Andy, your Dad, and your Mom have impacted this world! Know that while they watch you and every milestone you accomplish … so do the rest of us! What a wonderful letter to your little angel and healer of hearts. These eloquent words are so thoughtful and heartfelt for you Lucy. You are loved beyond your wildest dreams. One year already it does not seem possible. Have a wonderful birthday and many more to come. THOU SHALT EAT CAKE! Such a wonderful memory for her, course she won’t believe a word of it when she wants to go on her first date (sorry Alan but it will happen). But behind it all she will know how much she is loved by both of you and all of her family and friends. She is a special little girl and a very funny one too. Happy Birthday Lucy we love you too. Hugs from Ronan, Brandon, Willow, baby, Auntie Audrey and Uncle Frank.